For a detailed map of the Ashton Gardens and the latest schedule of events click on the Schedule tab above and choose the Download Schedule button. 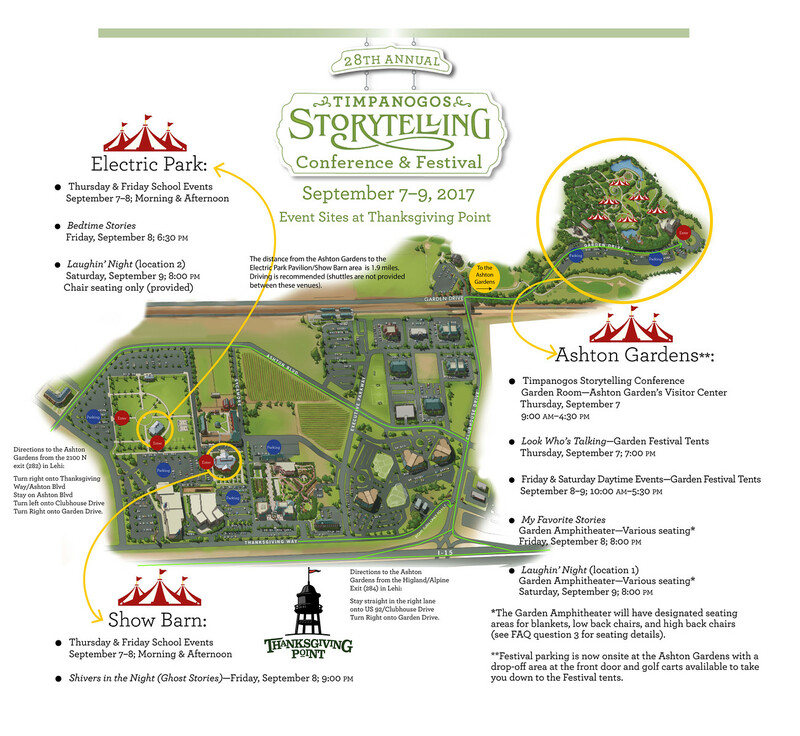 The Timpanogos Storytelling Festival will now be on the Thursday, Friday, & Saturday, after Labor Day, September 7-9, at our new location—Thanksgiving Point in Lehi, Utah (see map below). The Timpanogos Storytelling Festival is one of the nation’s premier storytelling events. Attendees from across the United States and Canada come to hear stories from unforgettable performers in an unbelievable setting at the Ashton Gardens at Thanksgiving Point. The new location at Thanksgiving Point will provide attendees a beautiful and convenient location for Festival events. Click here for more information about the move to Thanksgiving Point. Click on the tabs above for additional information including: schedules, storyteller bios, and frequently asked questions. Hotel discounts are listed on question 16 of the FAQ tab. Check out the map below for where events will be happening at Thanksgiving Point! (click here for larger map view). The Festival’s featured performers are some of the best storytellers from around the world. This year’s group features award-winning entertainers who have performed on some of the world’s most prestigious stages including the Smithsonian, Lincoln Center, Kennedy Center, World’s Fair, British National Theatre, Barbican, and more. The Festival is a great place for the whole family. Between storytelling performances, there is live music by some of the region’s best bands and even puppet performances for the little ones. During the day, potters are also on hand to help attendees create their own bowl or cup. Join storytellers Charlotte Blake Alston, Catherine Conant, Donald Davis, Carmen Deedy, Josh Goforth, Michael Reno Harrell, Bil Lepp, Tim Lowry, Sam Payne, Barbara McBride-Smith, Shonaleigh, and Brenda Wong Aoki for an amazing weekend of stories, laughter, and music. Although we may come for stories, don’t let the fun stop there. This is a festival, after all, and there are puppets, potters, jugglers, food, and live music. Many of the region’s most talented music acts show up throughout the weekend—from blues to bluegrass and jigs to jazz, there is a little something for all listening ears. The young ones will want to flock to the puppet stage, and everyone is welcome to learn from professional potters on real pottery wheels. The food is fresh and there are lots of options to satisfy any hunger. With talents as varied as the symphony orchestras with which she often performs, Charlotte Blake Alston is unique in the cultural abundance with which she augments her tales. Stitched together with brilliance and texture, Charlotte tells stories guaranteed to color your world-view with vivid impressions of people and vistas you have never imagined. Often accompanied by music, Charlotte opens your eyes and heart to a new way of experiencing the world around you. She has received numerous honors and awards, including the Zora Neale Hurston Award from the National Association of Black Storytellers and the Circle of Excellence Award from the National Storytelling Association. Charlotte, with her breadth of experience and skills, her generosity of spirit, and her dignity of character, is gratefully welcomed back to Timpanogos. “Storytelling is the coming together of everybody, the first art,” Aoki says. “It’s what shamans did, connecting heaven and Earth, and weaving the collective unconscious into a community.” Combining numerous elements of art into a communicative whole is Brenda Wong Aoki’s gift. Swirling Japanese Noh and Kyogen theater with contemporary stories, adding a healthy helping of commedia dell’arte, and finishing off with American Jazz and modern dance, Aoki serves a sumptuous banquet of storytelling to her audiences. Listening to Brenda is an indulgent and rewarding experience not to be missed. If Elvis was the King of Rock and Roll and Michael Jackson was the King of Pop, storytelling’s reigning monarch would have to be Donald Davis. As a master of the personal story, Donald Davis invites you into the stories of his life to discover the stories of your own. A Sequoia in the forest of tellers, Donald’s North Carolina cadences transport you into a miraculous place where, by listening to his stories, you find yourself. Though laced together with wit and laughter, Donald’s narratives always glow with wisdom and humanity. Truly, he is an essential part of the very foundation of the Timpanogos Storytelling Festival. No one plays with an audience like Carmen Deedy. Regardless of the number of people in the venue, Carmen shares every story from her heart to your heart, individually and personally. She possesses the unique gift of not only speaking to all people, but to each person, simultaneously. She once said, “Great story is the art of letting go.” But even as she ‘lets go,’ Carmen will hold your heart in the palm of her hand. She has been an invited speaker at venues as varied as The American Library Association, Refugees International, The International Reading Association, Columbia University, the Smithsonian Institute, TED, the National Book Festival, and the Kennedy Center, but her favorite audience is her grandchildren, for whom she also loves to cook—a true abuela cubana. The Jack tales of the Appalachian Mountains painted the background for Josh Goforth’s childhood. His musical ability is as natural to him as green on grass, but it took carefully honed skills and hours of practice to develop that talent into the brilliant performer you’ll see here. Add to toe-tapping music his carefully crafted and casually delivered tales, and you have an engaging experience unique in the world of storytelling. Drawing on a lifetime of varied and colorful experiences and peopled with genuine characters from all walks of life, Michael carries his Southern Appalachian youth with him as he wanders deliberately across this country and many others. With the intrinsic authenticity of a genuine balladeer, Harrell weaves the threads of his observations and experiences into a cozy afghan of tales, highlighted with wicked wit and poignant reflections. Bil Lepp is a study in contrasts. A thoroughly honest man, he is a five-time champion liar. Behind that “yup, yup, yup” persona is an absolutely brilliant mind--so smart he’s scary, but really funny too—kind of like a cross between Neil deGrasse Tyson and Robin Williams. An accomplished author, Bil Lepp’s books cover topics from parenting to very little things. As carefully architected as The Eiffel Tower, Bil’s stories often start out plausible, then quickly morph into the outrageous and fantastic. On occasion, he is completely serious and you can follow him into stories of the courage and honor of ordinary folks. But beware—Bil’s wit will hit and you will never see it coming! Tim is a human time machine who makes history happen in your hands and collapses hours into moments of magic. It is a pleasure and a joy to be swept along into one of his narratives and an instant later you realize an hour has passed. With careful and deliberate, but nearly invisible crafting, Tim’s “off-the-cuff” stories flow as luxuriously as melted chocolate and are just as delicious. A Festival favorite, Tim ranks among the top tellers on the audience’s “must-hear” list. With mesmerizing melodies to envelop his touching tales, Sam Payne tells stories with songs and sings songs with stories, interweaving the two so seamlessly that there is no need to differentiate. An author, a songwriter, a teller, and a teacher, Sam blends all four disciplines together and creates a unique form of entertainment all his own. While you can catch Sam Monday through Friday at 2 pm Eastern on Sirius XM Radio, you don’t want to miss a chance to hear him live and in person. With keen intellect and wry British humor, Shonaleigh tells tales as full of wonder as the face of a five-year-old at the circus and as wise as a Jewish bubbe (grandmother). Combining English wit and Jewish wisdom, Shonaleigh creates a storytelling genre of her own styling. Simultaneously unique and cozily familiar, she embroiders a tale as nimbly as a faerie queen and dances her way around your imagination as skillfully as braiding a challah. Her repertoire of tales is uncommonly vast, numbering over three thousand stories gathered from around the globe and ready at a moment’s notice to fill your mind with marvels. A self-described “full-time daydreamer who moonlights as a storyteller,” Ed has entertained audiences around the world for more than thirty years—and has been featured at our Festival since 1994. A true spinner of yarns, both epic and ridiculous, Ed draws from centuries-old traditions as well as modern-day spur-of-the-moment improv. Dubbed the “Robin Williams of Storytelling,” he is known for his delightful mixture of whimsy, wit, and wisdom. Click on the links below to read more about the Festival’s Performers and to see Food Options. 1. Can I attend both the Conference and the Festival? Yes, if choosing a weekend family pass click the dropdown option to add a conference pass to your purchase. ADULT COMBO–Conference & Festival Weekend Pass–2017. This Combo pass is cheaper than purchasing a Conference and Festival pass separately. If you are interested, don’t forget to add a Conference Lunch 2017 (available soon) to your purchase. 2. What does the Festival Weekend Pass include? adults, children (ages 12 and under), students (with ID), or seniors (65+). (due to popularity, locations must be selected upon purchase and cannot be changed). 3. Which Laughin’ Night location should I choose? Laughin’ Night performances will happen at the The Garden Amphitheater and The Electric Park Pavilion. Both venues have amazing lineups. Click on the schedule tab to see who is performing at each event venue. 1. The distance from the Ashton Gardens to the Electric Park Pavilion is 1.9 miles driving is recommended (shuttles are not provided between these venues). 2. There are also some seating differences between both locations. Please read the description below to find the venue that best meets your needs. 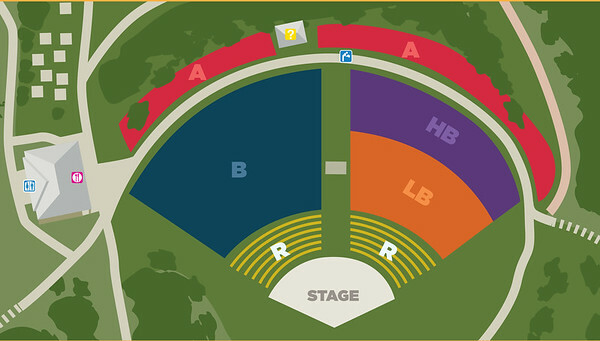 The Garden Amphitheater is split into different sections: a blanket area, a low back chair area (no taller than 30 inches), and a high back chair area. Each section will have a designated area that will be clearly marked (see picture below). If attendees are interested in having a chair for the performance, they need to bring their own and sit in the appropriate area. There will also be designated areas for wheelchair seating along the rim of the amphitheater. The Electric Park Pavilion will have chairs set up for all attendees. There is also a designated area for wheelchair seating close to the stage. 4. Where do I park for each event? In contrast to previous years, guests can park at the Festival. Guests will be directed to designated parking areas as they arrive at the Ashton Gardens. For evening events at The Electric Park Pavilion and The Show Barn, you may park in any available parking stalls near the venues. The Thanksgiving Point Trolley will run from the Museum of Natural Curiosity to the Garden Visitor Center from 9:30 am-6:00 pm on Friday and Saturday. Starting at 6:00 pm on Friday and Saturday, attendees can enter the Ashton Gardens through a second entrance located near the Museum of Natural Curiosity. 5. Are the events handicap accessible? Disabled parking is available at the front of the Garden Visitor Center (a valid disability parking permit is required.) Disabled parking areas are also available at both The Electric Park Pavilion and The Show Barn. Paths to the Gardens can accommodate wheelchairs, but wheelchairs and other conveyances are not available for rent through Thanksgiving Point. Volunteers will be available with golf carts to help patrons who need assistance to navigate the Ashton Gardens. 6. What time do gates open for each event? 7. Can I purchase tickets at the event? Tickets for events that have not sold out online are available for purchase at the event. However, evening events, especially Laughin’ Night, regularly sell out. In order to avoid disappointment, please purchase your tickets online before the event. Special early bird discounts are available until August 1. Unlike previous years, paper tickets cannot be purchased at the Orem Public Library. Please order your tickets online. Please call 801-228-1350 for questions about tickets or events. 8. Is there an online schedule for where each storyteller will be performing? Yes, click on the schedule tab above to see who is performing at each Festival event location. Click also on the storyteller tab to read more about each of the tellers. 9. Can I purchase just evening tickets? Yes, evening tickets are listed on page two of the ticket page. 10. Can I attend the Festival for just one day? Yes, adult & child passes for either Friday or Saturday daytime events are listed on pages 2–3 of the ticket page. 11. Where can I see a list of ticket prices? Click here to see the full list of ticket prices. 12. Is there an age limit to attend the Festival? No, but with the exception of Bedtime Stories, the Festival is intended for adults, teens, and older children with longer attention spans. If young children become disruptive, we do ask that their guardians take them out of the performance space until they have calmed down. Everyone ages 3 and up must have their own ticket. Child passes are for kids 12 and under, and children under 10 must be accompanied by an adult. Please also remember no toddlers or babes in arms in the performance tents. 13. Will there be American Sign Language Interpreters? ASL interpreters will be available at evening events at The Garden Amphitheater. Please call 801-228-1350 by September 1 to schedule an ASL interpreter for other Festival events. 14. What will the weather be like? Festival events happen no matter what the weather is that weekend. With the exception of indoor events like the Conference and Shivers in the Night, all events are held in large outside tents or in an outdoor amphitheater. The large performance tents provide shade, but in case of rain, a poncho may come in handy. Average daytime temperatures are 80 F and above, but early mornings and evenings are often cool. 15. Is there transportation from the airport? 16. Are there discounts to hotels near Thanksgiving Point? Click here to access their special rate (starting at $99 per night and includes Wi-Fi, fitness center access, pool access, and an onsite restaurant). Click here to access their special rate (starting at $119 per night and includes free local shuttles, complimentary breakfast, Wi-Fi, and a pool) or by calling 1-888-492-8847. 17. Is there a student discount? Yes, it applies to any high school or college student with a valid school ID. 18. What food options will be available at the Festival? Utah restaurants will serve breakfast, lunch, dinner, snacks, and drinks at the Festival. Enjoy food from Costa Vida, Magleby’s Fresh, Malawi’s Pizza, Tucanos, Wallaby’s, The Trellis Cafe, and Thanksgiving Point Concessions. Most meals are around $10.